Guin received her BS in Biological Sciences / Conservation with a cognate in Wildlife Biology from Thiel College in Pennsylvania, and completed her Associates in Veterinary Technology from Tri-County Technical College here in South Carolina. 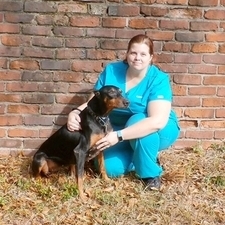 She has worked at Elam Animal Hospital since 2010 and particularly enjoys our exotics patients. Outside of work, she loves spending time with her son Silas and a menagerie of animals including Pele the Brazilian Mastiff, Jorah the German Shepherd and C.H.I.P.S. the pot-bellied pig. 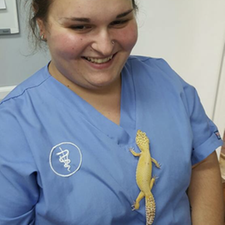 Guin is our resident Dr. Doolittle and has worked with all creatures great and small-- she is almost always rehabilitating a lost or injured animal for release back into the wild. 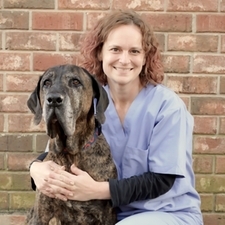 Jennifer joined the Elam Animal Hospital family in 2016 and is excited to be back in general practice after a career in specialty medicine both here in Columbia and in her home state of New Jersey. As a previous Oncology Technician, she has a passion for patient care and attention for detail that shines through in everything she does! Outside of work, she is incredibly active with her three dogs, Moo, Lilith and Ollie. 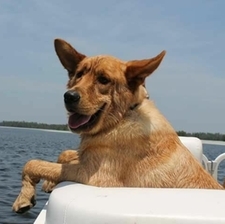 They enjoy dock diving, agility, training in FastCatl, and hiking with her husband, Tim. She also loves to snow ski. Has been a tech for over 10 years. Worked as a technician at a cardiology research center with pigs, sheep, large hounds and calves. Danced jazz, tap and ballet starting at the age of 3. Rachael is truly a wonderwoman, and to describe her as anything less would be an understatement! She joined the Elam family in 2014, and is a certified groomer with 17 years' experience. She has a special talent calming nervous clients and has transformed many pets who have previously been excused from other grooming facilities for fear or aggression. We are so lucky to have her on the team! Her passions outside of work include being outside and yardwork/landscaping, any and all things Disney, and spending time on the lake with her 2 cats Mercury and CAt (Carbon Astitine) and Labrador Retriever, Pearl. Previously coached USSSA softball and contributed to a three-peat winning streak. There's not a Disney movie she hasn't seen--which might explain the unique vintage Disney posters that decorate her grooming room. You can't keep her from working. She is always working! 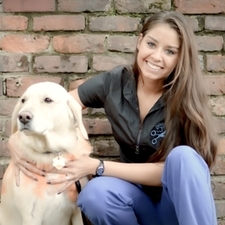 Ash has been a Veterinary Technician for almost two years now. 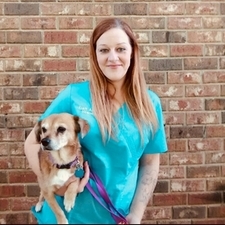 She is currently in school to get her degree as a licensed Veterinary Technician. She truly has a soft spot for the smaller breeds. Ashley joined the Elam Family in the Fall of 2017. We are extremely excited to have her on our team. She is excited to meet our clients and help them get to their best potential. Ash has a soft spot for chihuahuas. She likes to see live bands. Kaylee moved here to South Carolina from Washington State with her husband Kris (diesel mechanic), Dog Raider, Leopard Gecko Cleo in 2015. 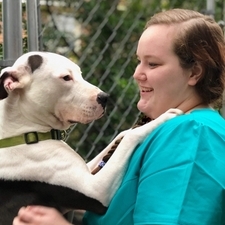 She went to Penn Foster Veterinary Assisting School Program and is now currently in for Veterinary Practice Management with Penn Foster as well. 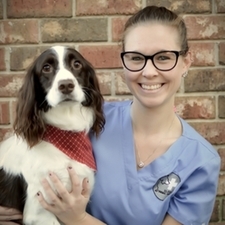 Kaylee started with Elam Animal Hospital back in May 2015 in the kennel. She has 3 dogs Daisie, Rebel "wobble" Rader and a cat named Monroe. Kaylee will drive to snow if there is none in South Carolina. Bekah joined the Elam team in the fall of 2017. She studied nursing at Midlands Technical College, but realized she wants to work with animals. Bekah has a love for all animals. She loves to with cuddle all of our clients. Bekahs dream is to become an Exotic Veterinarian. Bekah is an animal lover no doubt, but reptiles are her passion. She loves to help others. Kristen joined the Elam team in the summer of 2017. She has 5 animals. 1 Chihuahua named Pepper, and a Doberman Pinscher named Holly. She also has a Bearded Dragon named Dragoness. She also an African Grey Parrot names Harpy. Kristen's career path is to become a Veterinary Technician. Her favorite genre for movies is Horror. Her father owned a kennel.
. Nick has a special place in his heart for all animals here at Elam. He was certified in pet CPR. He has a twin brother. In his spare time nick likes to get lost in a good book.